Also, I have done some research into the inhabitants of the building, but I can only check on genealogy websites at the library, so that’s slow going as well. Since I don’t have much to report, I thought I would talk a little about the buildings that were on the block and put them in a bit of context. Knowing it was a boarding house can help us know the economic class of the inhabitants. Frequently, boarding houses were built for a more itinterent working class crowd, more than likely mostly single men. These were very popular in the downtown area, in the International District and near more industrial sections of town. The old South Lake Union area was rife with them. Rife, I tell you. The listings for the Altamont on the Seattle Times Digital Historical Archives at the Seattle Public Library tell a little different story. 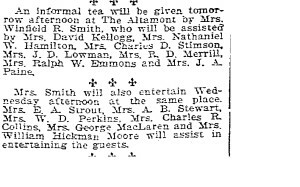 People who live there are mentioned in the society pages of the Times (or at least one woman, Mrs. Winfield R. Smith who, it seems, is constantly hosting informal teas.) That and some of the occupations of the people in the building lead me to believe that the Altamont was a bit higher class. Not super-rich people, mind you, but distinctly upper class and people who were striving to seem like society. We get it, Mrs. Smith. You have friends. We’ll talk more about Winfield R. Smith in the future, but for now we’ll leave you with this picture of a little kitten asking you to love it. Won’t you? Won’t you love it? 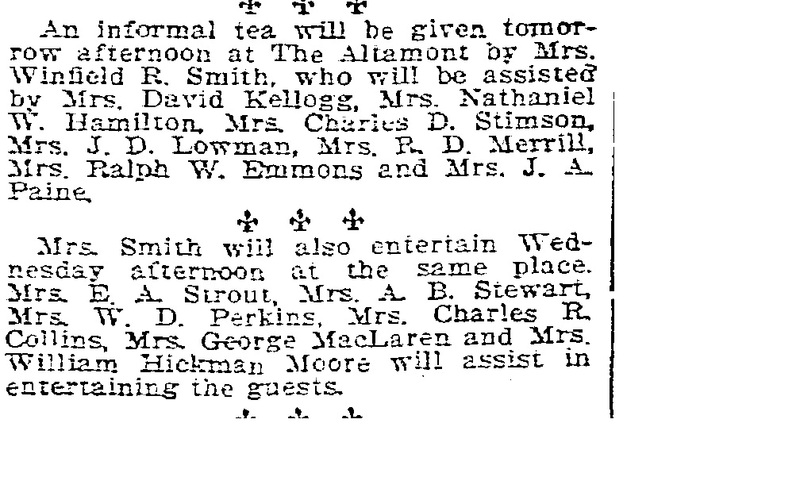 This entry was posted in Altamont and tagged Altamont, boarding house, Mrs. Winfield R. Smith, Society Pages, tea.